As you probably already know, an IMEI number or the International Mobile Equipment Identity number is a 15 digit number which can be used to identify any mobile device uniquely. You can easily find the IMEI number of your mobile phone if you have it tight now, just dial *#06# and you will see it. You should always write down the IMEI number of your mobile phone at a safe place. This is because if you ever loose your phone or if its stolen, you will need to use its IMEI number to track and find your lost or stolen mobile phone. But what if your Android phone is already lost and you don’t have its IMEI number? 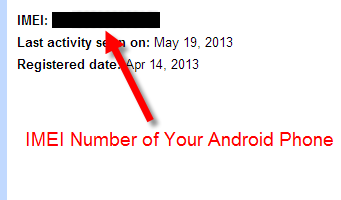 Don’t worry, you can still find the IMEI number of your Android phone. The first thing you may have done after buying your Android phone is adding your Google Account to your device. And you probably don’t know, but when you add your Google account to your Android phone, it saves all the details about your phone in its database, including the IMEI number of the phone. You can retrieve the IMEI number of your lost or stolen Android phone from your Google account easily. 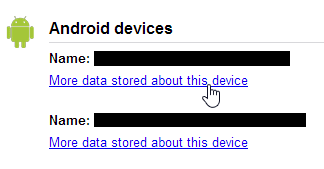 Just sign in to your Google Dashboard, and scroll down a bit to find the ‘Android devices’ section. Here, you will see a list of all Android devices that you have used in past to login to your Google account, including your lost or stolen Android phone. Find your lost Android phone in this list and click on ‘More data stored about this device’ option. You will immediately see the IMEI number of your lost or stolen Android phone. You can now use this IMEI number to find your lost or stolen Android phone. Also check, How To Trace, Track And Recover Your Lost or Stolen Android Mobile Phone.